Samsung announces the colorful, Android 4.1-powered, 7-inch Galaxy Tab 3 tablet for kids, featuring a dual-core processor, apart from preloaded apps and content for children. Electronics giant Samsung has launched a new 7-inch tablet, called the Galaxy Tab 3 Kids. The tablet is a bright and colourful variation of the Galaxy Tab 3 and comes preloaded with apps, parental controls and content for children. The Galaxy Tab 3 Kids has a 7-inch display screen with 1024 x 600 pixels resolution. It has a dual-core 1.2GHz processor with 1GB of RAM and 8 GB of internal storage expandable via microSD card slot. The tablet has a 3 MP rear camera and a 1 MP front camera for video chatting. The Galaxy Tab 3 Kids does not support any network connectivity, but comes with Wi-Fi 802.11 a/b/g/n on the 2.4 and 5GHz bands. It runs on Android 4.1 Jelly Bean OS and features Samsung’s software customizations. The Galaxy Tab Kids has a child-friendly grip that protects the tablet. Samsung has also added a C Pen with the tablet which is like the S Pen and lets children draw on the tablet’s screen without damaging it. The tablet will be launched with a number of different stand options that are comfortable for kids. Samsung has added interesting features in the tablet including a time management feature that allows parents to set specific time periods during which the tablet can be used by their kids. It has a password-protected lock screen that can be unlocked by an adult to use the device. 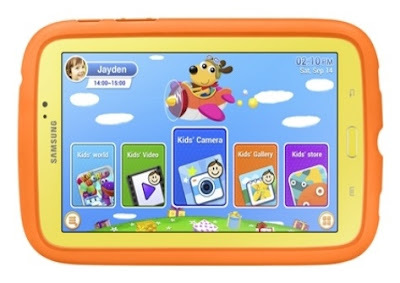 The tablet offers parental controls to select which apps they want their child to use through the Application Manager. Samsung has also preloaded the Galaxy Tab 3 kids with a number of education, gaming, and e-book reading apps and has added a new child-friendly app store on the tablet. The Galaxy Tab 3 Kids will be launched in September in Korea, and later on in the U.S., Europe, South America, China, Africa and Southeast Asia. The pricing of the tablet has not been revealed yet.